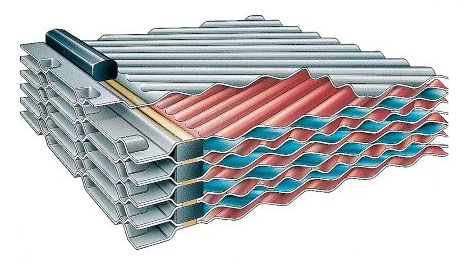 Heat Exchanger Plates | Valutech Inc. Plate Heat Exchangers are powerful, money-saving machines designed to take advantage of thermal conduction as a means of re-utilizing energy. Taking hot and cold fluids and piping them into a Heat Exchanger, gaskets separate the fluids and channel them into alternating sets of plates—allowing for the transference of the heat energy. From food process to district heating, plates are utilized as a medium for heat exchange in ways that take full advantage the process itself, making sure that nothing goes to waste without squeezing every last penny (here in Canada we got rid of the penny) out of the existing energy. Year after year plates gets remodeled and redesigned based on extensive research and testing, which is why it’s important to consider the particulars of the plates themselves. Purchasing good plates is a no-brainer, by design they are manufactured to help improve efficiency and productivity. That’s why you’ll want to make sure that the plates you’re putting to work in your Heat Exchangers are built strong, with a design in mind that takes absolute advantage of all the energy you have at your disposal. At Valutech we not only have access to a global inventory of plates, but are able to recondition the plates as well—offering a single point of supply for all brands of Heat Exchanger plates. Below you’ll find two images, courtesy of Alfa Laval, demonstrating the advancements and differences: a modern plate on the left and an old outdated plate on the right. A lot of improvements have been made over the years to maximize the ability of the plates. It might not look like much at first, but it’s the little things that make the difference and pay-off in the long run. 1) Each plate contains large holes called entrance necks. After the plate pack is fitted together inside the unit, media is sent into the pack from connection ports on the outside of the frame and enters the channels between the plates. A wider neck is important for stable velocity and low pressure drop. 2) The distribution area at the top and bottom of the plates is to help fluid spread evenly throughout the channels in between plates. These days, Heat Exchangers are generally vertical in operation—they stand upright when they’re working. If the fluid isn’t being spread across the entire surface area of the plate, the unit won’t be able to properly take advantage of the fluid’s thermal energy. 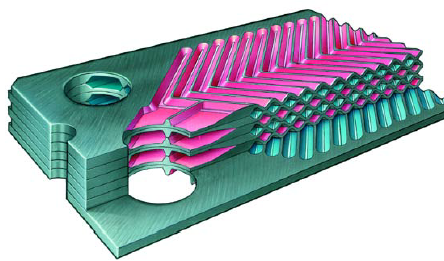 3) Plates are specially corrugated to generate turbulence, provide better flow rates, and help maximize surface area. The grooved chevron patterns ensure that fluid isn’t just slipping along the side of a flat surface. In order to maximize conduction inside the unit, resulting in the transfer of heat. Knowing that you’re buying reliable, quality plates is key when looking to optimize your units. When you know what to look for, it can be easy to spot the difference. That being said, sometimes you won’t be able to see the technology at work. Plates have come along way, and are getting developed in ways that go behind flow patterns and size. Profitability is driven by efficiency and productivity, and when it comes to plate performance it’s all about optimization. Taking refuse or discharged fluids and making cost-effective use of that thermal energy is great. It means that you are using pre-existing heat instead paying to generate new heat. But if your plates aren’t doing as much as you are to min-max your operation, you’re flushing money down the drain—plain and simple. Properly engineered plates expand the overall transmission area within the unit and generate higher levels turbulence, making sure you get full advantage of everything your equipment was designed to do. ALL BRANDS OF PLATES ARE AVAILABLE! CALL OUR VALUTECH ENGINEERS FOR MORE DETAILS.